The eternal quest and craving for spending quality time in the midst of nature is innate in all individuals. India with its rich biodiversity heritage offers among the most desirable destinations for wilderness tourism across the globe. With its long list of tiger reserves, national parks, and wild life sanctuaries, there is ample scope for one and all to spend thrilling moments in the forests of India, for observing a favorite bird or an animal in its natural habitat. Of the twenty eight tiger reserves in India, ‘Tadoba Andhari Tiger Reserve’ (TATR) certainly stakes its claim for being one among the best for various reasons. TATR is considered among the best tiger reserves of India, where tiger population is increasing rapidly. It has a richer and denser population of tigers, making it a tiger trailer’s paradise. Recent reports, on dwindling tiger population from even the best protected tiger reserves, have revealed that the most magnificent among the cats is still threatened for its survival despite all efforts being made to conserve it. At many such reserves, it is either a common experience of the visitors that they return without sighting the tiger, as the tigers have become so rare; or due to disproportionate tourism the tigers have got so much used to human presence that they behave like tame animals or pets. It is this quest, for experiencing the magnificence of a wild tiger in its awe inspiring grandeur and grace, that brings nature lovers to TATR; where one enjoys seeing the tiger in its natural habitat and behavior. TATR is unique as the park remains open throughout the year, while other parks and sanctuaries are closed during the monsoon, as it has round the year accessibility in the large buffer areas. TATR, also, stands out as one among the unique locations where a record number of ‘tiger sightings’ are reported throughout the year. Reports also mention that the tigers of TATR appear to be in good health as can be seen by their sheer size and agility. 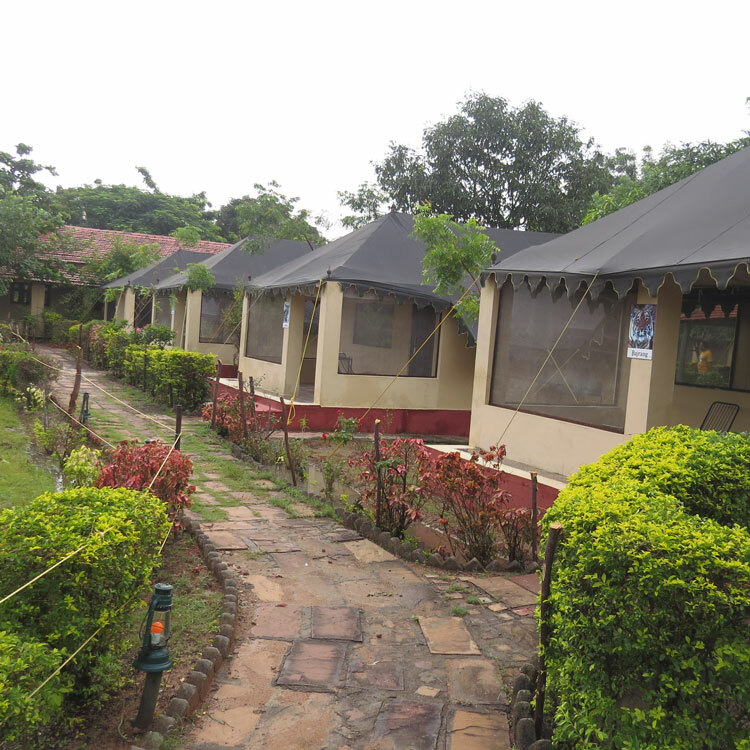 With no anti social, anti environment and insurgent elements within and around its vicinity, TATR certainly scores above all the other Tiger reserves. 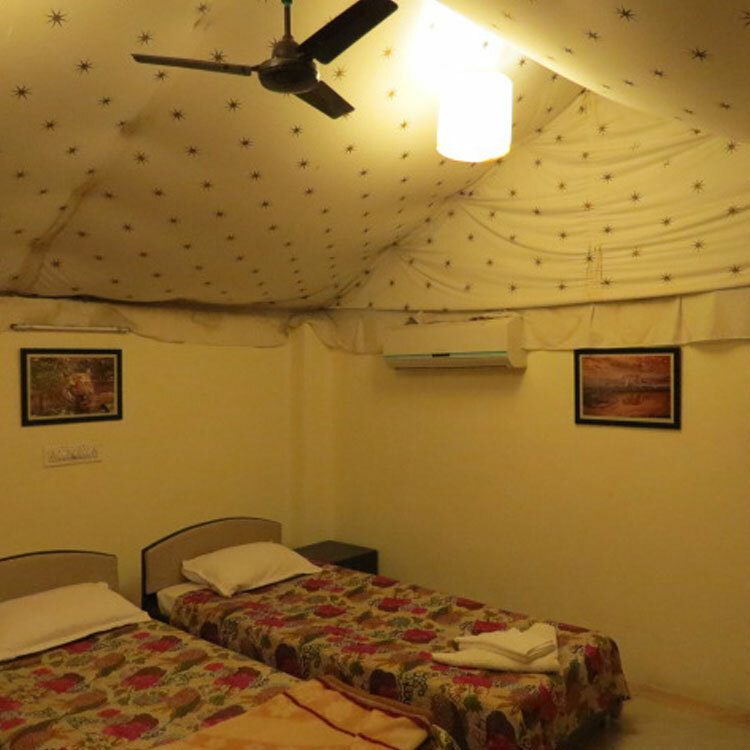 TATR can take more visitors, but for the shortage of adequate facilities for overnight stay and accommodation, especially during peak season, which is the main deterrent for the guests. 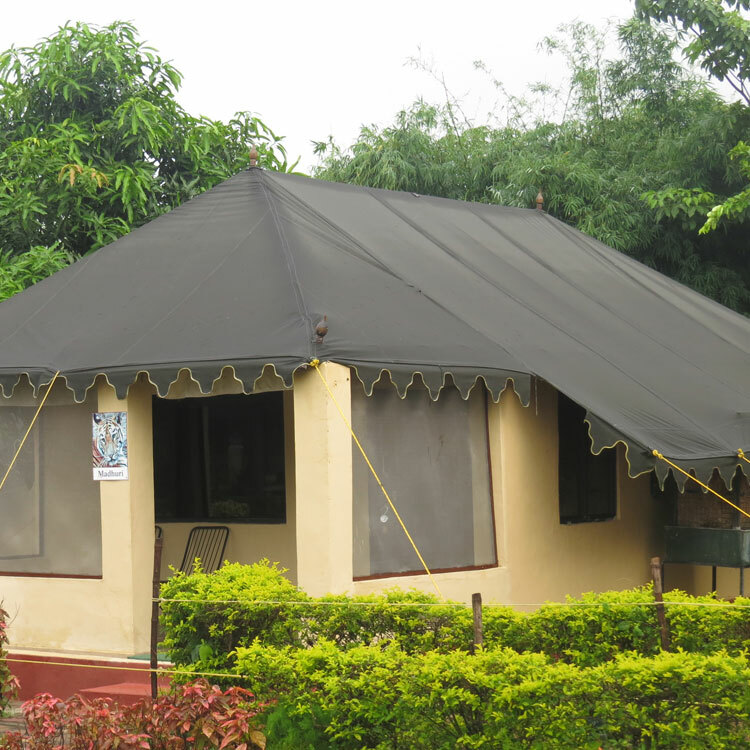 Camp Serai Tiger therefore adds one positive step forward for providing world class accommodation and services for the serious wild lifers willing to visit TATR to enjoy its wild life. The forests spanning over TATR and ‘Chimur Hills’ are classified under ‘southern tropical dry deciduous forest’ of deccan peninsula, which are dominated by teak interspersed with bamboo thickets and other indigenous trees like mahua, ain, dhawda, tendu, bija, haldu, salai, semal and jamun. The TATR consists of two forested hill areas in the north and the south, joined by a narrow valley. Through this gorge, flows the ‘Tadoba River’ that pours into the Chichghat valley. The Chichghat valley is a dense natural forest with ponds and waterholes, grasslands and meadows. Tadoba lake is a perennial water source for the region. The lake also acts as a buffer between the Park Forest and the extensive farmland extending right up to the Irai dam. TATR is located within Chandrapur District, Maharashtra, India, which includes the areas falling under erstwhile Tadoba National Park and Andhari Wildlife Sanctuary created in 1955, which was later combined into TATR –one of the 28 Tiger Projects in India. 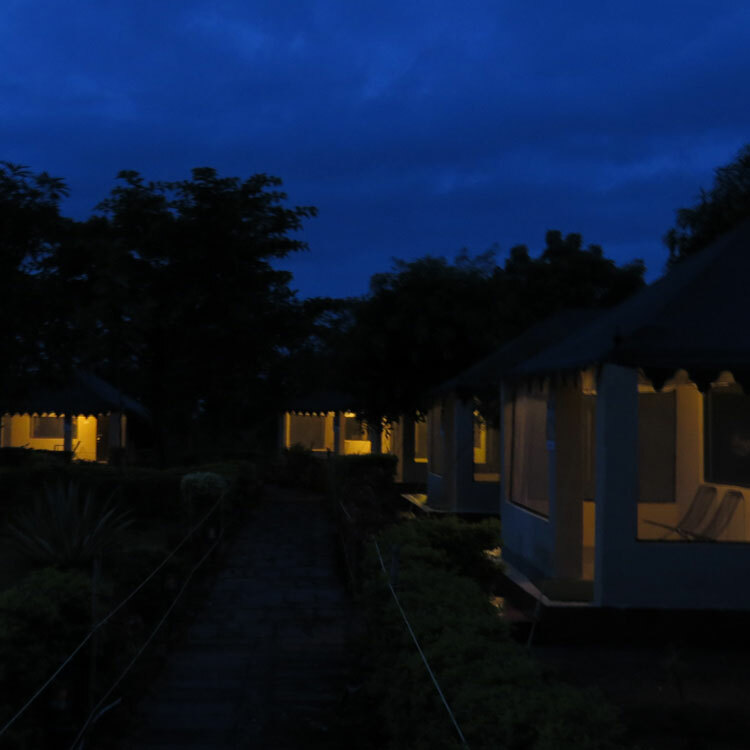 TATR is spread over 623 square km area, consisting of two forested rectangles of the Tadoba and Andheri ranges. The TATR is included in a continuous forest patch of 2000 square km, with Tiger occupancy in 775 square km, and has a potential to become an important source population for the Navegaon-Indravati Landscape through the northern forest patches in the districts of Chandrapur, Garhchiroli and Bhandara. Altitude Average 284.07 M. Above MSL. The TATR is unique and spectacular because of its sheer richness of flora and fauna. The animals that can be sighted throughout the year include: Tigers, Leopards, Sloth Bear, Gaur (bison), Hyenas, Jungle Cats, Small Indian Civet, Palm Civet, Wild Dogs, Rusty Spotted Cats, Rattel, Four Horned Antelope, Flying Squirrel and many species of ungulates like Sambar, Cheetal, Nilgai, Indian Mouse Deer and Barking Deer. The Birds make it an ornithologist’s paradise, with over 195 species, including serpent Eagle, Honey Buzzard, Paradise Fly Catcher, Aquatic Birds, Owlet and Raptors. Reptiles include marsh Crocodile, Rat Snake, Python and King Cobra. Insects are present in large numbers, the exciting ones being 70 odd varieties of spiders and butterflies. TATR remains open throughout the year! However, the best time to visit is from October to May. In the summer when water becomes scarce, most of the animals including tigers can be seen near the water holes. Hence, one’s best chance to spot a tiger is (between) February and June with temperature soaring up to 48 degree Celsius! Often during the summer pug marks of tigers and leopards can be spotted on soft soils around the lakes of ‘Camp Serai Tiger’, as the camp is located in between the TATR and the Erai dam along a beautiful corridor that lead to the perennial source of water in the summer, when other sources have dried up.